The space saving K-Compact coffee maker brews one of three cup sizes in under a minute, and is the slimmest Keurig removable reservoir coffee maker. Space saving. Crowd-pleasing. 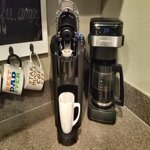 The slender and stylish Keurig K-Compact brewer is our slimmest removable reservoir coffee maker ever, but still delivers the delicious taste and unparalleled convenience that the Keurig brand is known for. Designed to leave the smallest footprint possible, the Keurig K-Compact brewer is just over 8 wide, leaving you plenty of space on your countertop without sacrificing a thing. Brew 6, 8, or 10 oz. of your favorite beverages in under a minute. Choose from hundreds of delicious K-Cup pod varieties coffee, tea, hot cocoa, iced beverages, and more and enjoy a perfect cup, every time. 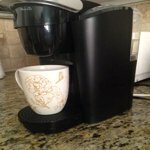 Or brew your own ground coffee with the Keurig Universal My K-Cup Reusable Coffee Filter (not included). The new Smart Start feature heats and then brews in one simple process for even more convenience. The K-Compact brewer has a removable drip tray to accommodate travel mugs, and its 36 oz. removable water reservoir allows you to brew multiple cups before refilling. BREWS MULTIPLE CUP SIZES: (6, 8, 10 oz.). Enjoy the most popular cup sizes. Use the 6 oz. cup size to achieve the strongest brew.COFFEE IN NO TIME: Brews K-Cup pods in under a minute.OUR SLIMMEST REMOVABLE RESERVOIR BREWER: 36 oz. 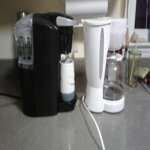 removable water reservoir make refilling easy.SMART START: Your coffee maker heats then brews in one simple process. No need to wait for it to heat before selecting your cup size.SIMPLE BUTTON CONTROLS: Just insert a pod, select your desired cup brew size, and brew a great-tasting cup in under a minute.ENERGY EFFICIENT: Auto off feature turns the coffee maker off 2 hours after your last brew, helping to save energy.REMOVABLE DRIP TRAY: Removable drip tray accommodates travel mugs up to 7.0 inches tall, and holds a full accidental brew for easy cleanup.DISPENSE HOT WATER: Open and close the brewer handle (without a pod) and select your cup size for hot water on demand. Space saving. Crowd-pleasing. 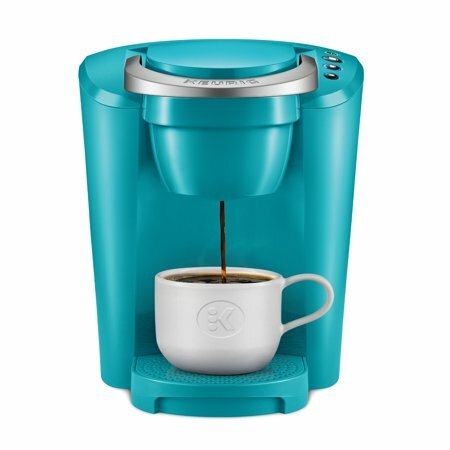 The slender and stylish Keurig K-Compact brewer is our slimmest removable reservoir coffee maker ever, but still delivers the delicious taste and unparalleled convenience that the Keurig brand is known for. Designed to leave the smallest footprint possible, the Keurig K-Compact brewer is just over 8 wide, leaving you plenty of space on your countertop without sacrificing a thing. Brew 6, 8, or 10 oz. of your favorite beverages in under a minute. Choose from hundreds of delicious K-Cup pod varieties coffee, tea, hot cocoa, iced beverages, and more and enjoy a perfect cup, every time. 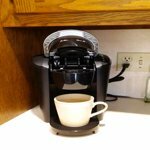 Or brew your own ground coffee with the Keurig Universal My K-Cup Reusable Coffee Filter (not included). The new Smart Start feature heats and then brews in one simple process for even more convenience. The K-Compact brewer has a removable drip tray to accommodate travel mugs, and its 36 oz. removable water reservoir allows you to brew multiple cups before refilling. Don't just read about this product's features--see for yourself! I ordered this Keurig K-Compact Classic Series Brewer because I have owned a Keurig coffeemaker for my home and I love it, so I figured having one at my office would be great too. The coffeemaker was packed perfectly, so it arrived looking as perfect as it possibly could. I was glad to find that this unit is about one fourth smaller in width than the Keurig I have at home because I needed this to fit on my desk. Also, this simplified version of the Keurig coffeemaker does not have a clock or timer, so I simply turn it on to warm it up and shut it off immediately after the coffee is prepared. The water tank on this unit is pretty ample and can hold 36 ounces, so I only have to refill it every couple of days. 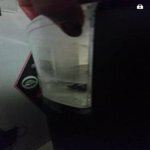 I also like the water tank better than my premium Keurig coffeemaker at home because it is so much easier to remove and replace, the tank on my premium Keurig is kind of fumbly when you try to put it in place. All around, this is a terrific little coffeemaker. Oh, and it makes a great cup of coffee! How is it possible that I have gone so long without this machine? The unit is fully assembled. The only thing I had to do was remove from the box and remove strips of tape. 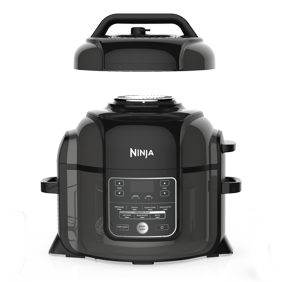 Prior to the first use, you should clean the water reservoir and complete a dispenser cleaning. The cleaning involves a tap of the single serving button and tossing out the water. Super simple, instructions are included. After that, you add a K cup. It took less than 45 seconds for my cup to fill with coffee. The coffee was hot, smelled amazing, and tasted excellent. There is a max line on the water reservoir. With three uses of the smallest cup option (6-8 ounces), a bright blue light indicated to add water. I thought this machine would be useful in the home or in a business. Individuals can select tea or coffee, whatever is of interest to that person. 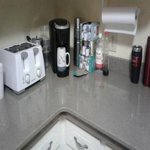 When you have guests or clients, small touches such as individuals options can make a world of difference. No more wasting a kettle tea of or pot of coffee. Great for a gift. 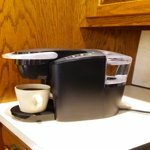 How do you review a Keurig coffee maker...? Either you have one and you absolutely love it, or you think that it's too expensive. 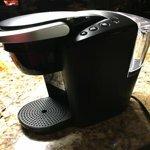 Well, Keurig is offering a "compact" version of their famous coffee maker at Walmart for around $60. 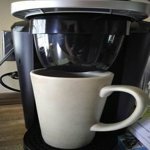 This compact version has a three cup reservoir and still heats your coffee one perfect cup at a time using the same "k-Cups as the famous big brother. included with this version are three different kinds of coffee for you to sample....light, medium, and dark roast. That's almost $40 worth of coffee making this coffee maker comparable in price to the most basic coffee maker that Wall-Mart offers. 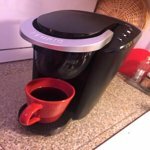 Like other Keurig coffee makers, it is noisy as it creates that magical brew that it is so famous for making...it is also just as speedy. 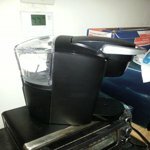 I could list all the awesome features and all the reason's that I love this coffee maker, but at this price you should simply find out for yourself. I'm in love with this Keurig! 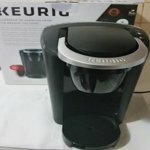 Being a Keurig fan and owning the original brewer and giving the compact brewers as gifts to family, I was anxious to get this updated slim version of the original. It measure 12.5"H x 8.2��W x 13.2”D and takes up much less cabinet space but still has a reservoir to allow three different size brewing options; 6, 8 and 10 oz. The reservoir removes easily and holds 36 ounces of water. I had a fantastic cup of coffee in under a minute, which is the standard brewing time. I love that the unit came with three boxes of coffee to allow for varied preferences. It came with Green Mountain light roast, Caribou medium roast and Donut Shop extra bold. If you already own a Kuerig you will love this slimmer version. 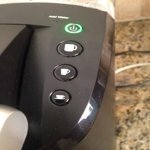 If you have never owned a Keurig this unit is a must since it covers both the slim body and reservoir which is truly missed in the single cup compact version. It comes in black and a beautiful red. You can only get this unit at Wal-Mart. I always hear people talking about Keurig and about how great it is. I figure is just a coffee maker like any other, right? But it's NOT! I am so glad I got one, I've only had it for a little over 2 weeks and I am in love with it. I'll start by saying that I previously had 2 coffee makers, one for single servings and one for multiple servings, and it's only my husband and I that drink coffee at home. But this Keurig is amazing for single serving and the best part is that it holds up to 36 Oz so I don't have to keep adding water like with any other single serving coffee maker when only my husband and I are going to drink coffee. And it heats up the water very fast, under 4 minutes. So even if I want to make coffee for more people it's so easy to add water and serve their coffee in less than 5 minutes. The selection of coffee is great as well. I know for sure that I will not go back to the “regular” coffee makers, this one has my heart and it's here to stay. Thank you Keurig for making it so easy for busy people like us. I love how the Keurig single serve coffee brewer fits nicely under my kitchen cabinet. This brewer is much slimmer and more compact than my last Keurig coffee maker that took up most of my counter between my stove and refrigerator. But it still makes the same great steaming hot cup of coffee and in a choice of three different sizes. The smaller the cup, the stronger the coffee will be. It was extremely easy to set up. One feature that is nice that my old maker didn't have is that in the morning when I turn on the machine I can pop in a coffee pod and press the button for the size cup I want. The machine will then warm up and automatically start brewing the coffee. The only con is the water tank. It is small and needs refilling often. But then you get fresher water more often too! Also the water tank is hidden in the back of the machine, so you don't always know when the water is near running out. But there is a light on the front that lights up when the machine needs water. Overall this is a good little coffee brewer and I would definitely recommend it. 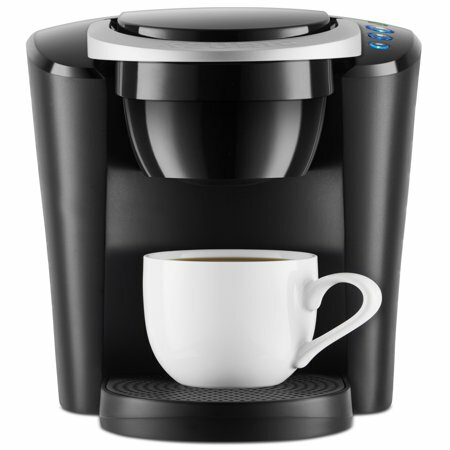 If you're a coffee drinker, you need a Keurig in your life. 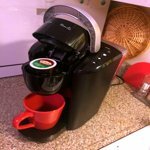 My husband and I are avid coffee drinkers and never thought that a Keurig would be economical for the amount of coffee we consume. To our surprise, it fits right in. It's a huge time saver and allows us to take something off our list in the morning. We don't have to worry about measuring the water and grains or storing the extra for later. Just push power, choose your size, and put in the k-cup. Simple and quick! 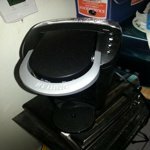 This one is a Keurig from the compact series and is smaller than the original Keurig. It's actually about the same size as a standard coffee maker. 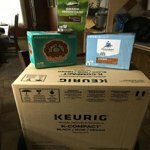 Our Keurig kit came with three brands of k-cups. My favorite is the Donut Shop blend. It has a bold and strong flavor. My husband prefers the Caribou k-cups. That blend has a natural, subtle sweetness. If you have your own blends of coffee, the reusable k-cups fit like a glove and work perfectly. We purchased our reusable k-cups at our local dollar store. We are most definitely happily pleased with the compact Keurig. I like the Keurig coffee maker because it allows me to make coffee "to order" for my guests without having to brew an entire pot on my old coffee maker. It came with 3 boxes/types of 18 coffees pods to get acquainted with product and types of coffee. Set up was easy and so was brewing. Nice pictorial of getting the product ready for it's first use. A couple of things could be improved though. Could have used a troubleshooting instruction regarding minimum filling of the reservoir. There is a max fill line on the reservoir but no minimum fill line. I made several cups of coffee and kept getting a light on indicating that I needed to fill the reservoir. Since I was only brewing a cup at the time, I didn't want to fill it too high, but unsure how full it had to be to brew a cup. Ended up adding water several times until the "fill reservoir" light went out and it allowed me to brew coffee. Therefore the 4 versus 5 rating. 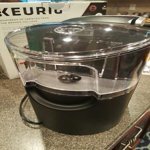 This Keurig is a great space saver for anyone wanting one without losing too much counter space. It's extremely fast at heating & brewing, has a large water reservoir, & is very easy to use. The downside, however, is that all the coffee I have made with it has a very strong plastic taste to it. So much so that every cup has ended up down the sink. 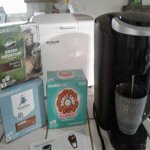 I tried several different k cups & even bought one of the brewing pods that you can put your own coffee in, but still, every cup has tasted like plastic. Maybe mine is defective, but I can't see me using this any longer, which is very disappointing. Thank you so much for taking the time to review your brewer. We’re sorry to learn about your experience and would like to offer our assistance. Please contact our consumer care team at 866-901-2739. Our representatives are available seven days a week from 7:00 am to Midnight, Est. We look forward to your call.